Black Lightning is a wonderful addition to the DC family. The show has everything one could want from a good story and action/suspense to great family dynamics which are all wrapped up in a slick presentation that one would be mistaken to pass up. You just can't keep a good Superhero "verse" down. In 2018 The CW expanded their "DCverse" with Black Lightning - the story of Jefferson Pierce, a high school principal, and father of two who has a very big secret. It just completed its first season run on the CW on April 17, and now Warner Bros. has released a 2-disc Blu-ray set for fans to bring home. Pierce (Cress Williams; Hart of Dixie) is a high school principal and father of two daughters. While this sounds like a "normal" life, Pierce is hiding something about himself. While he is known as a standup guy in his community, what isn't known is that he possesses a superhuman gift of controlling and harnessing electricity. Pierce, who once used to use these powers for good and served as a vigilante, finds himself back in the position of having to do so once again. His community is being taken over by gang violence and he realizes it's up to him to help save not only his community but his family. Aside from an amazing performance by Williams, the series co-stars China Anne McClain (The Paynes) as Jennifer Pierce, Jefferson's younger daughter; Nafessa Williams (Twin Peaks) as Anissa Pierce/Thunder, Jefferson's older daughter and fellow superhuman; and Christine Adams (Agents of S.H.I.E.L.D.) as Lynn Stewart, Jefferson's ex-wife and a neuroscientist. Marvin Jones III (Harry's Law) plays Tobias Whale, Black Lightning's main adversary; and James Remar (Dexter) is Peter Gambi, Jefferson's oldest friend and former member of the A.S.A. (American Security Agency, a U.S. Government organization that supervised the creation of a national team of super-agents known as the Force of July). This ensemble cast is terrific and really help to showcase Williams while moving storylines along. Black Lightning Season 1 is presented in 1080p AVC with a very light cheery palette. Skin tones are natural, details are very sharp, and the colors are true. Warner Bros. Home Entertainment has truly done a great job with video transfer this time around. Complementing the video is a 5.1 DTS-HD MA soundtrack. The dialog is crisp and clear while the special effects truly pop on this mix. Art Imitating Life: The Pilot Episode: Series creator Salim Akil and co-executive producer Pat Charles discuss the pilot episode and how one of the scenes was inspired by real-life events. A Family of Strength: This segment focuses on Jefferson Pierce's relationship with his daughters. Black Lightning: 2017 Comic-Con Panel: This segment features footage from the Black Lightning panel at 2017's Comic-Con. Gag Reel: Self-explanatory, this features some of the silly moments that took place on set. Black Lightning is a wonderful addition to the DC family on The CW. The show has everything one could want from a good story and action/suspense to great family dynamics which are all wrapped up in a slick presentation that one would be mistaken to pass up. Black Lightning Season 2 has already been greenlit and it will be interesting to see how they can "one-up" this season. 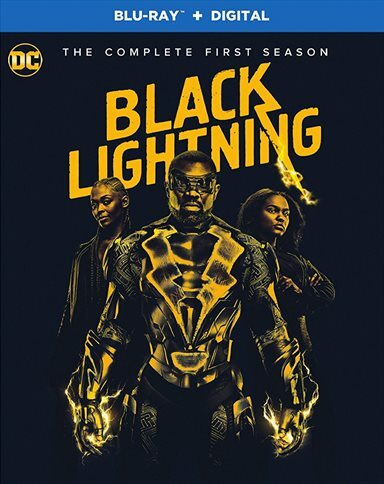 Download Black Lightning: The Complete First Season from the iTunes Store in Digial HD. For more information about Black Lightning visit the FlickDirect Movie Database.